The Central Chapter includes Wing Riders from all over Gauteng and Mpumalanga, with members from as far as KwaZulu-Natal, Swaziland and Limpopo. Central Chapter currently has 76 members whereof most participate in every monthly run to destinations in the mentioned provinces. Central Chapter endeavours to combine interesting and informative activities with enjoying a delicious meal and good company, all in one day and sometimes during weekends away. People join motorcycle clubs mostly because the club offers something that they are wanting – be it a sense of brotherhood, a sense of family, partying or spiritual healing. Central Chapter offers all of the aforementioned. 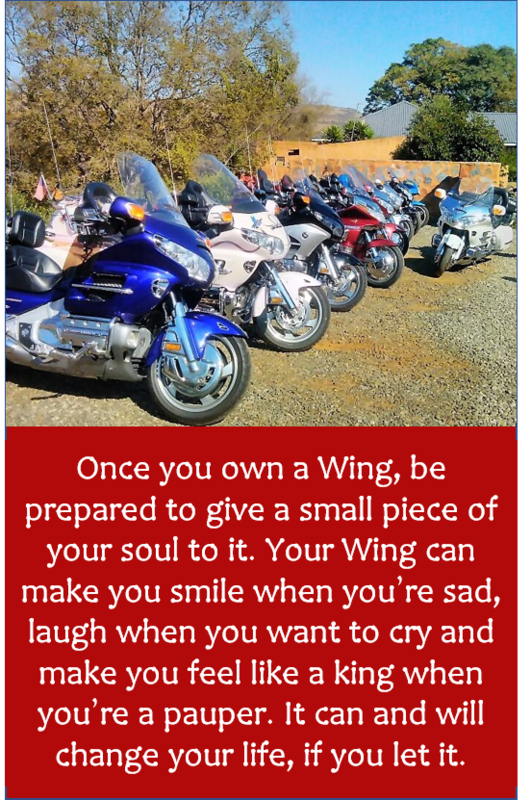 A general spirit of camaraderie exists and the term “Wing Family”, is often expressed. We are there for each other – in good times and also when the sun shines not so bright. The Central Chapter has a well-established reputation and, as a Chapter, we are welcome anywhere and are always invited to return. We wear our colours with pride and dignity. We welcome new members and pride ourselves on making them feel accepted and welcome. We love our bikes and trikes, we love our fun, we love our members and we love to get our knees in the breeze. If you are like-minded, come along on our next run. To join, please download and complete the Application/Renewal Form for the Central Chapter and submit to the e-mail address provided on the form. We look forward to welcoming you to the Central Chapter family.